A cut resistant glove that protects your noncutting hand when you rotary cut. 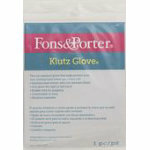 Made from a stainless steel and synthetic fiber, the glove fits right of left hand and has rubber dots for gripping. Machine washable.